Thornhill Green Burlap Socks, soft and warm, stylish horse design on green burlap background. 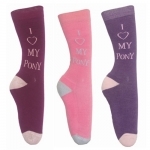 Bright, bold colored horseshoe pattern on a red background, these socks really make a statement. Thornhill Kids Horse Paddock Socks, soft and warm with adorable horse pattern. 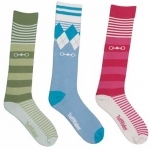 Thornhill Ladies Banded Horse Paddock Socks, soft and warm with horse pattern, in green or navy. Thornhill Ladies Horse Paddock Socks, soft and warm with adorable horse pattern. 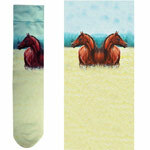 Bright, bold colored horse pattern on an orange burlap background, these socks really make a statement. Thornhill Silhouette II Socks, beautiful prancing horses pattern on a solid background. Thornhill Tie Dye Socks, beautiful tie dye design with horse head picture, stylish to match any outfit. Thornhill Vibrant Star Socks, bold colors in a vibrant star pattern, stylish design for any outfit. Thornhill White Beauty Socks, beautiful and bold colors in a watercolor style with white horse head picture. Meets the unique needs of riders for comfort & support, extra stretch in opening, reinforced heel. TuffRider Argyle Winter Socks, comfortable & warm & a fun fashion choice, wick away moisture. TuffRider ladies boot socks are standard size, stretch nylon/spandex, in three stylish colors. Comfortable and cozy TuffRider riding socks are quality made to last and keep children's feet warm. Technically designed riding socks with extra stretch opening, cushioned sole & reinforced heel & toe. Stylish children's bit design socks with cushioned sole, reinforced heel & extra stretch opening. TUFFRIDER I Love My Pony Socks - Get all Three! Ultra soft & insulated for riding in colder months. The adult boot socks is made of a CoolMax material, with a slightly padded heal and ball of foot. Woven arch support for comfort. The Highland Plaid socks are not your typical socks. They are a Jacquard, which are a woven material within the pattern of the fabric.